Two years before Ray Croc created the worlds most famous corporate fast food burger Lovey Yancey created the Fatburger, a gourmet burger counter restaurant franchise that was year’s before its time. Now that trendy fancy burger eating is all the rage, Fatburger still reigns supreme in its Southern California origins even with plenty of new kids on the block moving in on the gourmet burger gig. 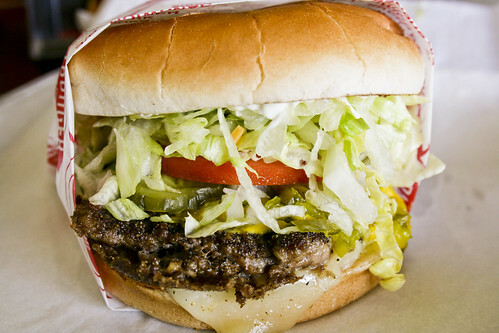 Fast track to Pukalani 2012, where Hawaii gets its own very first Fatburger joint. The recipe for the burgers hasn’t changed since Lovey started the business 60 years ago. Their patties are fresh ground chuck sirloin beef. The toppings are also what they are known for, mustard relish, pickles, and chopped onions, fresh sliced tomato, and shredded lettuce are all part of “the works” package. If you want a few extras like bacon, mushroom, egg, cheese, chili or guac they have that too for a buck or so more. In fact owner Ernie Abarro says he just dropped the price on the Fatburger meal deal, get one for $10.69, that includes a medium burger, Fat or Skinny Fries and a Drink w Free Refills, cheese for only 69 cents and extras like guacamole and bacon is just 99 cents. Fatburger happy hour runs from 4pm to 6pm daily, buy a medium or large burger meal and get a medium fat burger for free. Abarro has changed the scene at the sleepy upcountry Foodland strip mall with his new eatery. The casual counter order burger joint features great jazz and blues music over its speakers, its what Yancey was into when she created the brand, and the brand has continued to embrace that. Abarro has taken that concept one step further offering live music on Friday at dinnertime and on Saturdays at lunchtime in the outdoor dining area he has created at the center. This Friday slack key guitarist Cindy Combs will play from 5 to 8pm. Depending on how hungry you are patty size counts. Fatburger has a small 2.5 ounce patty, 1/3 pound patty (medium) and 1/2 pound patty (large). If your appetite can handle they have the XXL and the XXXL that doubles and triples the 1/2 pound pattys on your bun. For real burger enthusiasts Fatburger has the XXXL challenge, order it, eat the entire thing inside the restaurant and your photo goes up on the brag wall and you go home with a certificate to prove you did it. The great taste of their burger has a lot to do with their bread to meat to vegetable ratio. Their proprietary buns are designed to hold the size of the meat just right. They don’t get soggy, but they don’t overpower the juicy patty with a mouthful of billowy bread. 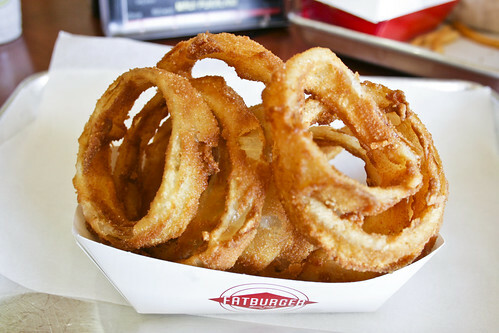 Fatburger has scrumptious sides too. Their fries come in just one size, but two kinds, skinny or fat. The fat steak fries are off the hook, and have less sodium than skinny versions. You can also add chili and cheese to your fries. Their onion rings are made fresh there, they batter them up and fry them crisp. Hot dogs, chicken fingers, BLT, turkveggie burgers, and sausage and egg sandwiches round out their menu. For kids they have a meal for $5.79 with fries and drinks with burger, chicken strips and hot dog options. For a sweet finish Roselani ice cream shakes come in 5 flavors, banana, cookies and cream and vanilla chocolate strawberry topped with a generous dose of whipped cream. They also have root beer floats and fountain drinks. The Fatburger Pukalani is off to a great start on Maui, so much so they have decided to work on opening one soon at Pearl Harbor on Oahu. The drive to pukalani is what makes it nice and different. Who wants to eat in kahului all the time. When we went the food was great. Fresh fries, the burger had tons of seasoning and i took the XXXL challenge. Will be going back. Was nice to see another option upcountry but after eating there I’ll never do it again. Paid over $28 for 2 meals! way too much lettuce could not taste the beef but then I saw that was due to the fact that the beef had no taste. Patty was kinda like swiss cheese from where all the fat melted away and the fat fries was stale. At that prices you only got one chance to impress me and they certainly missed it. Got similar reviews from friends, it’s not the worst burger but no ways was it worth it. You should open 1 in the Kahului area too, so people dont have to travel all teh way up to Pukalani. A great addition to Maui food options. I’ll be sure to visit when I hop over from the Big Island.